Enzo Life Sciences continues to expand its offering of unique target ELISA products with the introduction of Histamine ELISA kit. Histamine is an important mediator of immediate-type-allergic reactions. Because of its potent role in the immune response, histamine is present in a very transitory state in the body and can only be measured within minutes of release. The half-life of histamine in a biological system is four minutes before its conversion to n-methyl histamine. N-methyl histamine is a major product of histamine metabolism, is present in urine and has a longer half-life than that of histamine. This assay reacts equally to N-methyl histamine and histamine, making it an excellent choice for measuring histamine levels in urine. The Histamine ELISA kit provides a quantitative, competitive detection method for measuring histamine in human, rat, mouse and canine samples. These sensitive assays measure as little as 0.03 ng/ml of histamine in serum, plasma, urine, and tissue culture media and provide fully quantitative results that surpass semi-quantitative Western blot analysis. With the ability to analyze up to 40 samples in duplicate in less than 2 hours, these kits meet the needs for rapid, high-throughput analysis. Like many other Enzo Life Sciences ELISA kits, the Histamine ELISA kit is complete, flexible and thoroughly validated. They are supplied with an easy-to-follow protocol, pre-coated microtiter plate and liquid color-coded reagents to save the user time and reduce errors. The break-a-part strip plate design provides flexibility – not having to run all 96-wells at once. Each kit is put through rigorous fit-for-purpose validation and stability testing to ensure high precision, accuracy, sensitivity, and specificity. The release of the Histamine ELISA kit is the most recent addition to the Enzo portfolio of products for immunology research which also includes toll-like receptors, multidrug resistance assays, native bacterial and viral antigens, factors for modulating host response, HPV probes and antibodies for CD markers. 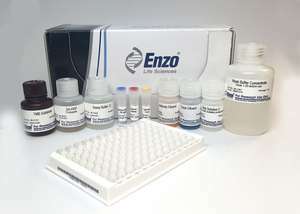 For more information on this ELISA kit or other Enzo Life Science products, please visit us at www.enzolifesciences.com or call us at 1-800-942-0430. Enzo Life Sciences, Inc. is a wholly owned subsidiary of Enzo Biochem, Inc. headquartered in Farmingdale, New York. The company is focused on providing innovative life science research reagents worldwide based on over 30 years of successful experience in building strong international market recognition, implementing outstanding operational capabilities, and establishing a state-of-the-art electronic information and ordering marketplace. Enzo Life Sciences, Inc. is a recognized leader in labeling and detection technologies across research and diagnostic markets. Our strong portfolio of assay kits, libraries, proteins, antibodies, peptides, and small molecules provides life science researchers tools for target identification/validation, drug discovery, cellular analysis, high content analysis, gene expression analysis, nucleic acid detection, and protein biochemistry and detection.